It can be quite easily said that money in football transfers has gotten out of control. Recently, Juventus have signed a 33 year old Cristiano Ronaldo for a staggering €100 million. Here, we are going to talk about how budgeting can actually rationalise such a move. Furthermore, following that analysis we will go through how to complete, upload, validate and import a nominal budget using Sage 200c. If you would have told me 10 years ago that someone would spend €100 million on a 33 year old, I would have laughed in your face and told all my friends how crazy you are. However, this is the situation we face today. My gut instinct is that Juventus are mad for making such an offer. Not only that, they’re giving that same man €576,923 a week, an obscene amount of money. That is the nature of the industry though, with high demand and low supply resulting in extortionate prices. It’s not the players fault they’re worth so much, it’s the way the market is. This is not to say though that this deal is not good business for both parties involved. For Real Madrid, they have actually made a profit on the man which cost them a world record breaking €94 million back in 2009. Additionally, they have had a 5-time Ballon Do’r winner in his prime for the last 9 years. Incredible business! How is this good business for Juventus? Juventus made €554,860,000 in the last financial year, meaning the Ronaldo deal was 18.02% of their income. This may seem extreme, but when comparing to the most expensive signings as a percentage of income, it doesn’t even break the service of the deals of old. Specifically, the record is currently held by a certain Zinedine Zidane all the way back with his transfer to Real Madrid in 2001. He moved for a then eye-watering €75 million, and with Real Madrid’s annual income at a lowly €138.8 million at the time, this accounted for 54.03% of their income. In fact, Ronaldo’s deal to Juventus doesn’t even break into the top 20 transfer percentages relative to income. 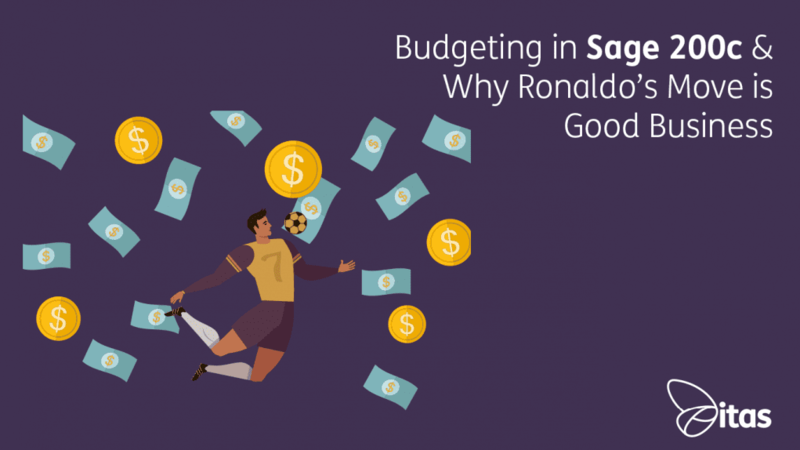 Additionally, it must be considered that with the impending marketing revenue Ronaldo will inevitably generate, such as TV deals and t-shirt sales, helped by the fact he’s still operating at the highest level, it’s easy to see how Juventus will make their money back, with interest! Budgets are used in all forms of business, from an international brand such as Real Madrid, to your local corner shop. Also, they can come in all shapes and sizes, so make sure you accommodate for this fact whilst completing the following process. Account Cost Centre – Nominal account cost centre. 3 text characters long and must exist in Sage 200c. Account Department – Nominal account department. 3 text characters and must already exist in Sage 200c. Account Number – Nominal account number. Up to 8 text characters and already exist in Sage 200c. Budget Year (this will not be available for versions 2013 or below) – Mandatory if you are importing budgets for multiple years. Year relative to current year, must be one of 0 for current year, 1 for current year +1, 2 for current year +2, ect. You can enter budgets for up to 5 years. Additional detail can be imported using the columns on the import. Change the ‘Data to Import’ section to ‘Budget Values’ to import nominal budgets. Selecting ‘Validate records only’ will check the import file is OK to import without errors. Selecting ‘Validate and import records’ will check the import file and apply the data to the Sales Ledger. You can specify the default values, if required. If you leave these blank in the import file, the specified defaults you now specify are automatically applied to the imported accounts records for you. This can save you time when preparing the import file. When you validate the file and the format is correct, you will get a ‘Transaction File Validate Complete’ message. It is important that you look at the reports produced as these will highlight any errors with the .csv file. Once you are happy with the .csv file and there are no errors in the report, you can now import the records using the ‘validate and import records’ option. And that’s that! You’ve now successfully imported your nominal budget into Sage 200c. If you need any other assistance, please don’t hesitate to contact us. Just remember, you’re expenditure is always relative to your income, so whether you’re spending pennies or millions, make sure you don’t break your budget!